Read through all the instructions before installing and using this RO system. We are certain that you will be satisfied with its performance and that it will serve your need for safe and clean drinking water for years to come. -If you have any trouble, please contact our tech support online. This reverse osmosis system uses advanced reverse osmosis technique to provide healthy and tasty drinking water. The heart of the reverse osmosis unit is an automatically flushed reverse osmosis membrane with 0.0001 micron precision filtration which removes bacteria, heavy metal, salt, bad mineral substance and other dissolved matter and chemicals in your drinking water. The 1st Stage: Spun fiber for removing sand, particles, dust, mud etc. The 2nd stage: Granular Carbon Filter for removing chlorine, organics, odor, smell, turbidity, etc. The 3rd Stage: Block carbon filter for removing chlorine, organics, odor, smell, turbidity, etc. The 4th Stage: RO membrane for the removal of bacteria, dissolved metal, chemicals, salt, other minerals, and other dissolved matter in the water. 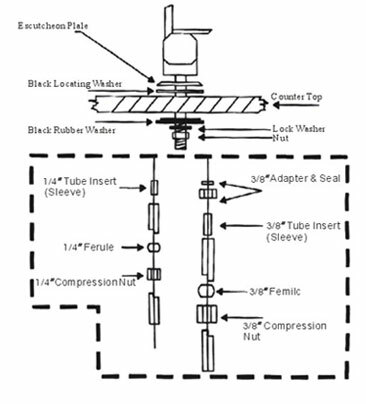 The 5th Stage: Post carbon filter for removing dissolved gasses. The RO system was designed to fit under a sink, however, because of space limitations or other reasons, the system’s flexible design allows for installation in other locations. When determining the location, remember that access to a cold water line, access to a drain, and ease of filter replacement are important considerations. All components and tubing should be located in an area, which is not exposed to freezing temperatures or direct sunlight. 1 Goose neck faucet: The faucet should be placed near the sink where drinking water is normally obtained, usually at the edge of a sink. 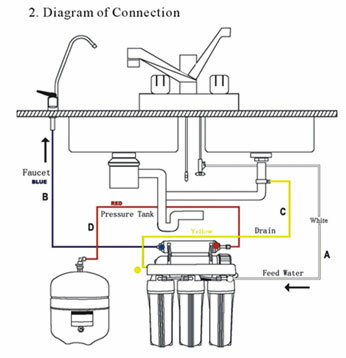 Convenience of use (filling of water pitchers and glasses) and an unobstructed open area under the sink for attaching tubing are important considerations. 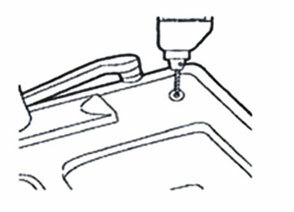 A ¾” diameter hole on a flat surface is required for faucet installation. The thickness of the mounting surface should not exceed 1-¼”. 2 Pressure Tank: the pressure tank may be placed where it is convenient, usually within 10 feet of the faucet: under the sink or in an adjacent cabinet are the best choices. These tanks can weigh up to 30 pounds when full of water, a firm, level area is required. If the tank is mounted remotely and a longer run of tubing is required, the tubing should be 3/8” outside diameter to prevent a pressure drop. 3 R.O. Unit: The R.O. is best installed on inner sides of the cabinet under the sink. The right side is recommended because all the tubing will be towards the back of the cabinet and out of the way. Remote installation is also an option. Choose a location where cold portable water and drain access is handy. 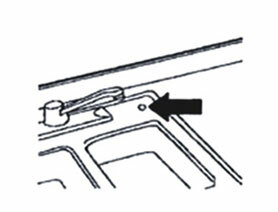 The mounting location should allow adequate clearance for water cartridge changes. 4 Supply Water Connection: The supply water valve should be located as close to the R.O. unit as possible. USE POTABLE COLD WATER ONLY. Softened water will extend the life of the R.O. membrane. 5 Drain connection: the waste water from the RO must go to drain. If discharging into a utility sink or standpipe, a gap of greater than 1” above the rim must be provided. DO NOT connect the system drain line to a dishwasher drain or near a garbage disposal. Back pressure from these units may cause the air gap to overflow. 1. Choose where to install the gooseneck faucet. Drill the hole for the faucet using the correct drill bit for the material drilling through (available from you local hardware store or home center). NOTE: When cutting the tubing make clean, square, cuts, failing to do so could result in poor connection and possible leaks. Put the plastic pipe thru the hex compression nut. Put the white nylon sealing washer on the plastic pipe, assemble and hand tighten the hex nut. it with the outlet of post inline carbon filter by plastic pipe. 2. 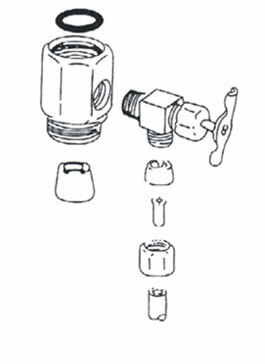 Install the supply water valve using the Tee fitting, and then connect to the water source. Caution: Be sure to connect to the cold water line. Hot water will severely damage your RO system. This damage is not covered under the manufactures warrantee. 3. 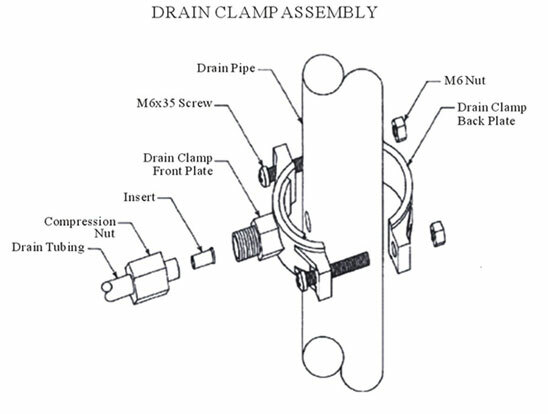 Drain Clamp Installation (for discharging into the sink drainpipe). Position the drain clamp on the drainpipe above the drain trap. Allow room for drilling. Tighten securely. Use a battery powered or properly grounded drill. Using the clamp port as a drill guide, drill a 7/32” hole through the wall of the drainpipe. DO NOT penetrate the opposite side of the pipe. CAUTION: The lowest point of the line should be point of connection to the drain clamp. There should be no sag in the line as this may cause excessive noise as the reject water is flowing to drain. 4. Install the pressure tank ball valve. NOTE: DO NOT adjust the air valve on the pressure tank. The manufacturer has already preset it. Wrap the threads of the pressure tank with Teflon tape. 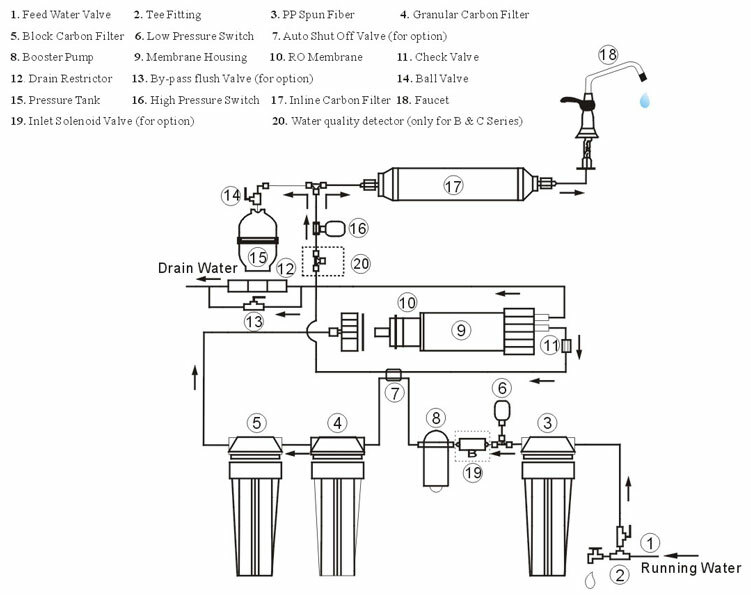 Attach the tank ball valve to the top of pressure tank and connect the pipe from the RO membrane to the tank ball valve and post carbon filter. 5. Mount the RO system with provided screws. Set pressure tank in place. 6. Connect all remaining plastic piping. 1. Turn on cold water supply valve and feed water valve, but close the tank ball valve. 2. Open the goose faucet. 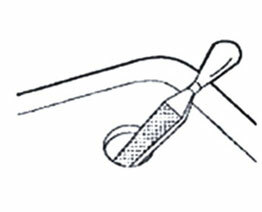 (pull the black handle to the open position). 3. Check the system, for leaks. 4. After about 5 minutes, the water will start to drip out of the faucet, let it drip for about 10 minutes, then turn off the faucet and open the tank valve. It will take about 4 hours to fill the pressure tank, depending on local water pressure. DO NOT DRINK THE WATER OF THE FIRST TANK PRODUCED BY YOUR NEWLY PURCHASED SYSTEM. 5. When the tank is full, flush the system by opening the faucet until the water in the tank is completely discharged and slows to a drip. 6. Turn off the faucet, and let the tank fill again. This process should take about 2.5 hours. 7. After the second tank is filled now you can enjoy the purified water. 8. Check for leaking daily at the first week and periodically after one week. 9. For the first few days you may notice milky colored water that separates after a short while, these are tiny air bubble in the water from the carbon filters these bubbles are temporary and they are normal and safe. To ensure the system is operating at its optimum level, certain routine maintenance must be performed. Frequency of maintenance performance will depend on feed water quality and level of system usage. *Change spun fiber filter as required or every 3 to 6 months depending on raw water quality and consumption. *Change granular carbon filter and block carbon filter every 6 to 12 months. *Change RO membrane as required or every 24 to 36 months. Use provided wrench. Close the water supply valve and the tank ball valve. Release pressure by turning on the faucet. Use the wrench to remove the filter cartridge housing. NOTE: when removing the cartridge, some water may spill out. Change the filter cartridges, and turn the system back on, check for leaks. Close the water supply valve and the tank ball valve. Release pressure by turning on the faucet. Remove the membrane assembly by unscrewing hex water tube nuts. Work over a sink or bucket to disassemble the outer housing from the membrane assembly remove and replace membrane, then reassemble. Reinstall the housing with the new membrane into the R. O. system. NOTE: filters and membranes are consumables. Their useful life is dependent on the quality of water supplied and consumption rate. If you are not going to use the system for a long time (you are on a holiday, tour, etc.) please disconnect the power supply (for units with booster pumps), turn off the water supply and drain the tank.